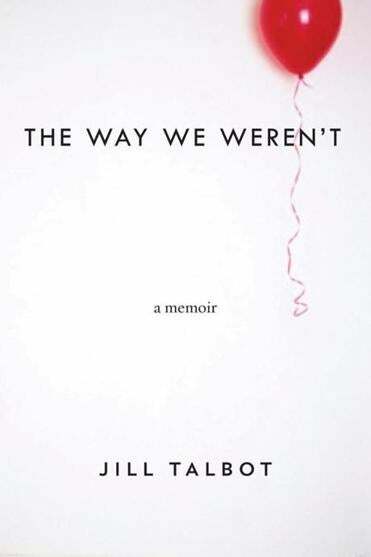 Jill Talbot’s “The Way We Weren’t” recalls despairing times. A magnetic pull sets in while reading “The Way We Weren’t,’’ a sinking into the author’s state of heart and mind, a compulsion to keep turning the pages. The memoir’s allure is a testament to Jill Talbot’s formidable talent. This was not an easy story to live, nor is it an easy one to read. But it could, of course — if it hasn’t already. You can prove it by Jill Talbot. With a doctorate in contemporary American literature and film and master’s degree in creative writing, she’s been employed as a writer-in-residence and professor of English at several US universities. Heading into a seemingly bright future, Talbot had every reason to believe she’d end up in the life that people like her (and us) believe we deserve. Instead, Talbot fell in love and had a baby with a man named Kenny, who begged her not to abort their lovechild, then disappeared shortly after their daughter’s birth, kicking off a decadelong spiral fueled by alcohol, obsession, and circumstance. Along with her critique of deadbeat dads and single motherhood in the United States, Talbot offers up a shockingly unsavory exposé of the devaluation of our educators. In her moment of need, Talbot’s academic career failed to protect her from abject poverty; in fact, a series of part-time, underpaid positions condemned her to it. In search of her daughter’s father, in search of a steady teaching job, in search of the truth of her own story, Talbot moves her child from one seedy apartment in one sad city to the next, all the while imagining an imminent reconciliation with the man who abandoned her. Throughout, Talbot offers equally compelling, opposing evidence that (a) she and her daughter are the victims of a callow cad and (b) her daughter and her ex are the victims of Talbot’s own instability and skittishness. Reinforcing Talbot’s skepticism about the existence of infallible truth, she refers to herself alternately in first and third person, a device that can be jarring. And despite her clever handling of conflicting culpability, her tone at times is more self-pitying than self-aware. Nonetheless, “The Way We Weren’t’’ succeeds brilliantly. Like the most expert practitioners of the genre, Talbot burrows deep into the minutia of her own life in service to a big, disturbing, and important story that contains multitudes.